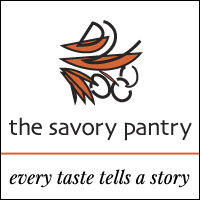 The fabulous folks at The Savory Pantry have a yummy dish for summer. I love shrimp and am always looking for new ways to make them, tasty, yet healthy. 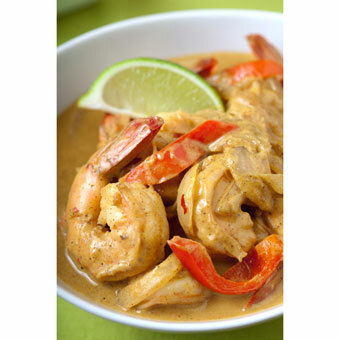 This dish is sure to please I would say, I love the flavors of coconut and curry together. Add 1 T of the olive oil to a skillet over medium high heat. Add onion and pepper; sauté for 4 minutes. Push the veggies to one side of the skillet and add the second tablespoon of oil to free space in pan. Add shrimp and chilies if using; cook until the shrimp just turns light pink on the bottom side (about 1 to 2 minutes). Turn shrimp and cook another minute or two until it is just cooked through. Stir the veggies and shrimp together. Reduce the heat to medium, add the curry sauce, coconut milk and tomatoes, if using, and cook until heated through and the sauce thickens. Serve over basmati rice. Garnish with lime wedges. I love cocunut milk based curries and I imagine this would also be very tasty with chicken as an alternative to the shrimp.